With its small, creeping habit and bright red, fleshy female cones, it is easy to see how Microcachrys tetragona earned its common name “creeping strawberry pine.” This miniature conifer is as adorable as it is interesting. With a fossil history that spans 66 million years of Earth’s history, it also has a lot to teach us about biogeography. Today, the creeping strawberry pine can only be found growing naturally in western Tasmania. It is an alpine species, growing best in what is commonly referred to as alpine dwarf scrubland, above 1000 m (3280 ft) in elevation. Like the rest of the plants in such habitats, the creeping strawberry pine does not grow very tall at all. Instead, it creeps along the ground with its prostrate branches that barely extend more than 30 cm (0.9 ft) above the soil. This, of course, is likely an adaptation to its alpine environment. Plants that grow too tall frequently get knocked back by brutal winds and freezing temperatures among other things. The typical growth habit of the creeping strawberry pine. The creeping strawberry pine is not a member of the pine family (Pinaceae) but rather the podocarp family (Podocarpaceae). This family is interesting for a lot of reasons but one of the coolest is the fact that they are charismatic representatives of the so-called Antarctic flora. Along with a handful of other plant lineages, it is thought that Podocarpaceae arose during a time when most of the southern continents were combined into a supercontinent called Gondwana. Subsequent tectonic drift has seen the surviving members of this flora largely divided among the continents of the Southern Hemisphere. By combining current day distributions with fossil evidence, researchers are able to use families such as Podocarpaceae to tell a clearer picture of the history of life on Earth. What is remarkable is that among the various podocarps, the genus Microcachrys produces pollen with a unique morphology. When researchers look at pollen under the microscope, whether extant or fossilized, they can say with certainty if it belongs to a Microcachrys or not. The picture we get from fossil evidence paints an interesting picture for Microcachrys diversity compared to what we see today. It turns out, Microcachrys endemic status is a more recent occurrence. 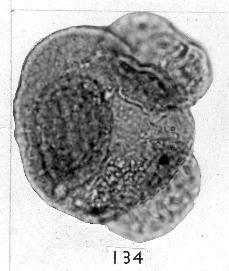 This distinctive, small, trisaccate pollen grain is typical of what you find with Microcachrys whereas all other podocarps produce bisaccate pollen. The creeping strawberry pine is what we call a peloendemic, meaning it belongs to a lineage that was once far more widespread but today exists in a relatively small geographic location. Fossilized pollen from Microcachrys has been found across the Southern Hemisphere, from South America, India, southern Africa, and even Antarctica. It would appear that as the continents continued to separate and environmental conditions changed, the mountains of Tasmania offered a final refuge for the sole remaining species in this lineage. Another reason this tiny conifer is so charming are its fruit-like female cones. As they mature, the scales around the cone swell and become fleshy. Over time, they start to resemble a strawberry more than anything a gymnosperm would produce. This is yet another case of convergent evolution on a seed dispersal mechanism among a gymnosperm lineage. Birds are thought to be the main seed dispersers of the creeping strawberry pine and those bright red cones certainly have what it takes to catch the eye of a hungry bird. It must be working well for it too. Despite how narrow its range is from a global perspective, the creeping strawberry pine is said to be locally abundant and does not face the same conservation issues that many other members of its family currently face. Also, its unique appearance has made it something of a horticultural curiosity, especially among those who like to dabble in rock gardening. Mature female cones look more like angiosperm fruit than a conifer cone.